A varied geology comprising two major episodes of superimposed, Early Tertiary lava flows separated by a thick palaeosol suggestive of humid Tropical like conditions, all of which are cut through by numerous dykes. The Lacada Point headland from lower path. Here it is easy to distinguish both the Lower and Middle basaltic formations and the red Inter – Basaltic palaeosol. A complex late- and post-glacial history that saw ice retreat from the area, sea level rise and fall and the para-glacial adjustment of marine cliffs to create, for example, the many bays and the extensive scree found along the coast. Panoramic view of dormant and active screes at Port Reostan. The Long-term exposure of the site to high-energy coastal conditions that worked with the underlying geology to erode and emphasise the distinctive embayed coastline and are now actively attacking the headlands they created. Outstanding view from Hamilton’s Seat, showing the characteristic pattern of bays and headlands within the Causeway Coast. A long, and ongoing history of human intervention including: stone extraction, footpath construction and road building, the construction and demolition of various buildings and the running of a high profile transport system. 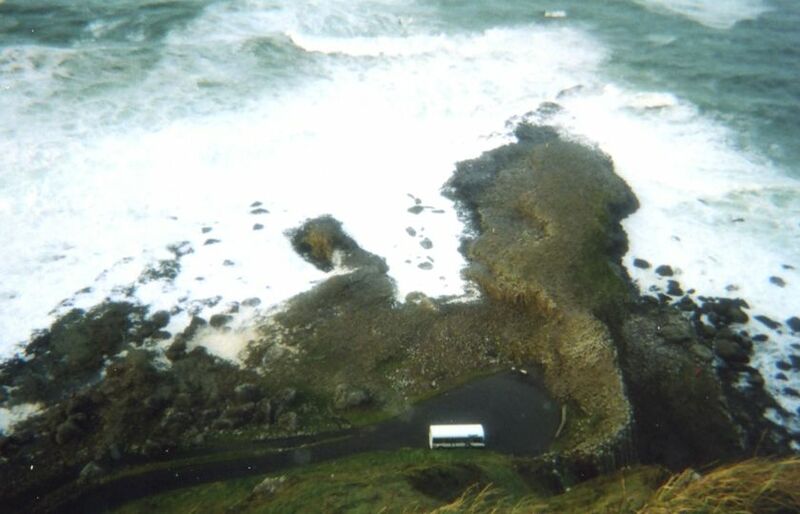 View of the Giant’s Causeway from Aird Snout on a stormy day, with the road that connects it to the Visitor Center and the ‘Causeway Bus’ at the turning circle.